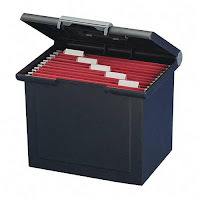 Enthusing about a file box may seem a bit like Steve Martin in The Jerk shouting as he runs up the driveway "The new phonebook is here!" But I'm really impressed with what I now call the Twyla Tharp Filing System (to go with the Alastair Fowler Writing Method) as a way to organize a book. Setting up the file folders is similar to dividing a book into chapters. Each of my red hanging files equals either one chapter or one portion of a chapter. The manila folders within each hanging file correspond to sub-sections of the book. If I decide to intellectually re-arrange the furniture, it's simple: just pick up and replace a file folder. The whole thing ends up as a 3-D representation of the book itself, something that my little brain understands much better than stacks of paper, or even paper put into other file systems. When I write tidbits of the book (what I guess I'll have to call the Anne Lamott Picture-Frame Strategy, to go with the other two), I print them out, note their computer file names, and drop them in the box. Okay, okay, I know that's what the computer is supposed to be for. But to my concrete-and-real-world-representation-loving eye, this works better, and I can tote it around the house like my special friend. It's sooooo cool.